As golf has evolved from the sport of kings to the game of every one, golf courses and clubs are trying figuring out how to market their businesses in the modern landscape. We live and play in a high-tech world driven by mobile phones, social media, snap chats, and posts. While golf is a sport rooted in tradition, today’s courses are looking for turnkey golf marketing solutions that connect golfers with their digital business at every touch point. Golfers want to see and experience the course online, book a tee time, and download an app that gives them a lay of the land – from yardage on the fairway to ordering a hot dog at the turn. To our generation of golfers, tweets are the new birdies and digital presence is the driver. It takes more than a beautiful site to inspire user experience and conversion. Definitely have vibrant images and videos – because golfers love them – and build your site with intuitive navigation, conversion elements with clear CTAs, and easy booking for tee times and tournaments. Optimize your site for local and voice search with keywords and questions people are asking search engines and capitalize on Google’s SERP features – from snippets to videos. Make your site mobile responsive and AMP pages based on user behavior analytics and what is most relevant to your audience and ROI goals. Most golf pros wear many hats, from running the shop to giving lessons to marketing. Trust me, they would rather be teaching and playing with members than posting on Facebook, Google+ and Twitter. Most courses without large marketing teams need their PGA pros to engage in social media outreach every day to fill their tee sheets and promote daily specials. To connect with your social community, your team will need a powerful social dashboard where they can blog, tweet, post and schedule from one place from their laptops, iPads and phones. Once you have a software platform for social outreach, engage your audience and reinforce your message – promoting twilight rates, open lessons, membership specials, and the speed of the greens. 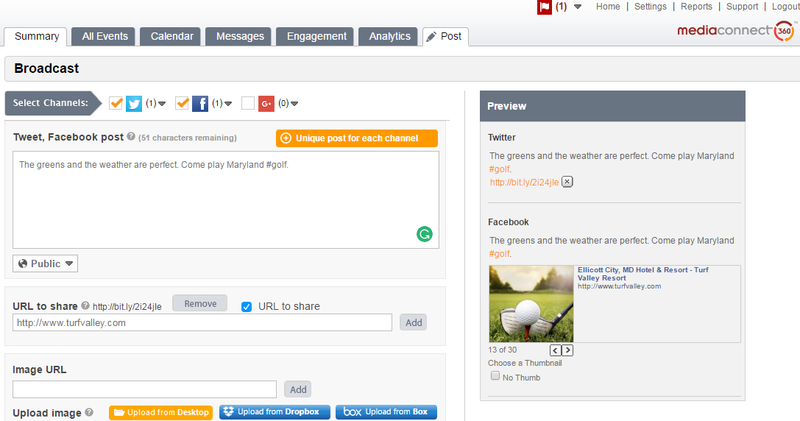 Post pics on Instagram and videos, and get your golfers engaged in your experience. Golf is a social game. Milestone’s MediaConnect™ 360 gives Turf Valley Resort the power to post and schedule Blogs, Facebook, Google+, and Twitter from a single, easy to use social outreach dashboard. The new cool factor in golf marketing is the GPS integrated APP. GPS enabled golf carts and watches are expensive and getting outdated. Add a downloadable APP on your mobile site and golfers will use it for scorecards, yardage, shot making, weather and messaging from you. If you utilize all the latest features, you can promote daily specials, use it as an online store, give tips, and even sell food and beverage during the round. Cart girls not included. 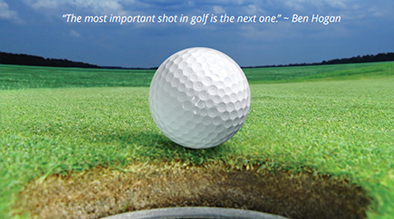 While golf is the game of life and you play against yourself, digital marketing is not. You always want to track and analyze your digital channels, revenue and competitive performance in the space. You can juggle between Google Analytics and other resources, which can be time consuming. 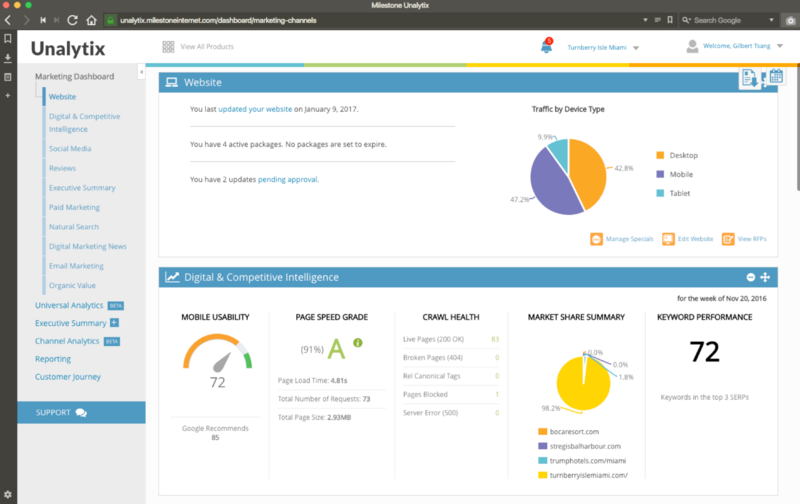 Or you can use intuitive distribution and competitive intelligence software that lets you track and analyze your data, site health and performance in one dashboard. Use a platform that gives you panoramic insights and targeted strategies so you can connect with your golf customers across every touch point – mobile, tablet and desktop. Find a user friendly dashboard that lets you track the customer journey across social, local and paid channels so you can adjust your strategy from one place. 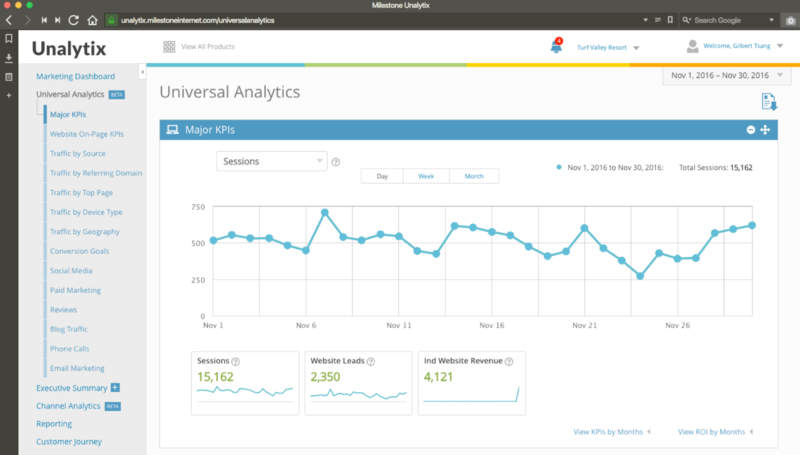 Milestone’s Unalytix Digital Marketing and Distribution Channel Analytics Platform empowers managers with organized data about their websites, SEO, local listings, social media, reviews, and paid search. Users get insights through intuitive dashboards and formatted reports. The Turf Valley and Turnberry Isle sites golf websites are high performing. We know you’re passionate about golf. You’ve conditioned the greens, your pros hope to inspire young golfers, and you want to promote your courses and tournaments. While Gary Player said “golf is a puzzle without an answer,” we know better. Create a holistic digital presence with a user friendly, mobile responsive site, that integrates social outreach, tee time booking, and an APP, and your golf business will drive presence, engagement and ROI. Milestone created a complete internet marketing strategy for Randy Watkins Golf Group, which owns and manages 3 semi-private golf courses in the Jackson Metro of Mississippi – Patrick Farms Golf Course, Whisper Lake Country Club and Lake Caroline Golf Club. They are driven by a passion for the game and PGA professionals who inspire young golfers. RWGG offers full-service clubhouses and amenities, lessons, tournaments, junior golf, specials, dining, and memberships. Their audience is families, individual golfers, couples, students and juniors who want the membership benefits of three clubs, as well as daily fee players. RWGG’s previous site was outdated in design, performance, and analytics. The site lacked branding and visual story, user journey, and was confusing to navigate. Milestone created a holistic marketing solution with a mobile responsive website, search optimized content with schema, an online store, and an event booking module all reinforced by social media. Milestone designed a highly visual, streamlined site with great imagery, intuitive navigation, and a persona-based branding message – “more than a club, we’re family.” A warm, modern design focuses on user experience and conversion, with clear CTAs for Memberships and Tee Times. The site highlights the three courses and amenities, and has optimized pages for memberships and events. The site also showcases landing pages, like member activities, junior and kid’s golf, and lessons. The Randy Watkins Golf Group site launched December 2, 2016 on the Milestone Galexi™ CMS. Launched December 2, 2017, the mobile responsive site gives golfers a robust digital experience, including downloadable scorecards, an integrated golf app, weather widget, changing specials and 4 photo galleries. Built on Milestone’s Galexi™ CMS platform, the site is responsive for mobile and gives managers the ability to update specials and events. Our goal was to create a site that was visual and golfer friendly, focused on user experience, and promoted memberships, tee times and tournaments. In the first month, the site has over 10,000 impressions and 600 clicks attributed to their new online visibility and organic presence. 54.8% of the sessions came from organic search, including non-branded search queries which capture new customers. 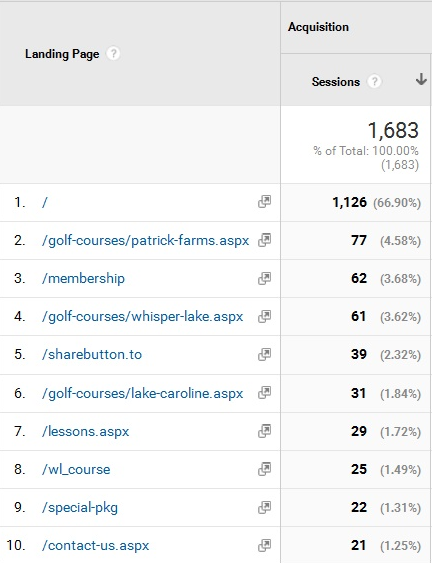 New landing pages for individual courses, lessons, packages, and membership are all drawing in traffic.